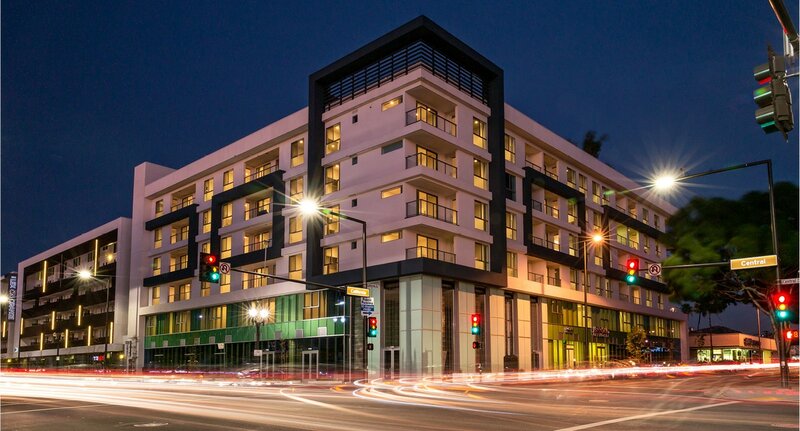 300 N. Central is a mixed use residential and commercial project located at the corner of Central and California Avenue in the City of Glendale, California. The project was completed in the first quarter of 2016. The structure is comprised of 80 residential units of one, two and three bedroom rental apartments on 6 levels, 165 structured parking spaces on ground plus two subterranean levels on an approximately 19,000 sf parcel of land. The ground floor also contains approximately 9,000 sf of commercial retail/restaurant space , building lobby and leasing office as well as a covered public space housing a public art display. The project additionally includes a roof garden with spaces for lounging, a fire pit, barbecue areas, a dog run and landscaping. Atelier V was responsible for the entire design, entitlement and construction phase of the project through its final procurement and occupancy. The deck level of the project has a semi-indoor swimming pool, additional seating and fire pit areas, an exercise room and common lounge for the residents. The project is a typical Podium Construction of Type III – 1 – Hour. The subterranean levels are all reinforced concrete structure, the ground level is a steel structure with steel and concrete decking and interior shear walls and the upper 5 levels are of wood construction. Special attention was given to the exterior wall line at the ground level to provide for maximum transparency and use of glass for visual access to the commercial portion by locating any shear wall within the interior of the building footprint.